I haven’t written a blogging-specific post in awhile, so today I want to talk about Nofollow links. Nofollow links have been around for awhile, and many of you may already be familiar with them. For those of you who aren’t, I wanted to create a quick guide that covers what they are, when they should be used, and how you can easily add them to avoid penalization by Google. Search engines use robots to “crawl” your page and discover what your content is about so that they can appropriately categorize and rank your site. When you link to another site from your page, those robots will follow the link and also crawl that page. Google treats links to other sites as an endorsement of that site, which can lead to a higher page rank for them as well. For example, if I write a post about how much I love the lemon pistachio donuts at Stan’s, Google will check out Stan’s and take note that I am giving them two thumbs up. They may also decide that they want donuts like I do a lot of the time. According to Google, “a site’s ranking in Google search results is partly based on analysis of those sites that link to it. In order to prevent paid links from influencing search results and negatively impacting users, we urge webmasters use nofollow on such links.” Continuing my example, this means that if I was paid to write about Stan’s delicious donut, even though I may wholeheartedly endorse them, I am being compensated for my endorsement which can be seen as an unfair advantage. Google has no idea if I actually love that donut or if I am just linking to it because I have been paid, so to be safe, they advise using nofollow tags on such links. If you do not use nofollow on non-organic links (see below for examples), you run the risk of being penalized by Google which can result in a lower page rank or removal of your site. The nofollow tag looks like this: rel=”nofollow” and is inserted into the html code of your page links. Rel stands for relationship, so you are telling Google that this link has a nofollow relationship and it should be ignored. Adding a nofollow tag tells search engines not to follow any outbound links that you may have on your site. This means that when the robots discover a nofollow link, they will not follow it outbound and will instead remain on your site and continue to crawl your content. If you are writing a sponsored post, meaning that you have been paid money to write about a specific subject. If you have been gifted a product in exchange for a review. Basically, if you are required to disclose your participation with a brand under FTC guidelines, you should “nofollow” any links to that product/service. If you are using affiliate links, or links where you have the potential to make money from a user’s interaction with them. Prior to the latest WordPress update, there was a very helpful WordPress plugin called Ultimate Nofollow, but since that time there have been compatibility issues and adding the tag manually is actually quite simple. Let’s use a link to Erin’s Inside Job for example. 1. Set up your link as you normally would. 2. To add a nofollow tag to this link, you will need to view your post in html mode. To do this in WordPress, simply change your view from “Visual” to “Text” by clicking on the “Text” tab in the upper right hand corner of your text editor. That’s it! Make sure that you are conscientious of the links that you use and that you are compliant with Google and the FTC regarding disclosure practices. Also, as a reminder, if you are interested in starting your own WordPress blog, the special discount pricing that I negotiated with Bluehost for online hosting will expire this Friday, August 7th. You can read my post How To Start A WordPress Blog In Under 5 Minutes for more information and access to special hosting rates! Important! 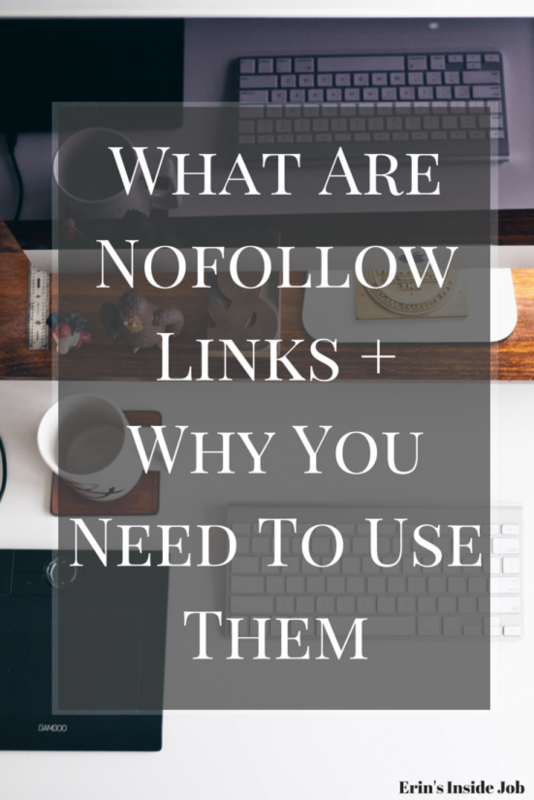 What Are Nofollow Links and Why You Need To Use Them. Great little tidbit that I actually never knew. Thanks for teaching me! Thank you or actually going into depth about this. And now I have even more work to do! I wondered what these were… thanks Erin for explaining how to use the tags! Anytime Bri! Glad I could help! Thanks for sharing this. Totally new info for me – and like Susie, I now have some things to consider 🙂 Any insight onto how to do this using Square Space or other non-WordPress blogs? Great information! I am relatively new to blogging and trying to soak up as much information as possible. Thanks for the tip! Anytime Heather! Let me know if I can help you out with anything else! Great post, I had no idea about nofollow links. I’m not at the point of having affiliate links or sponsored posts yet, but hope to in the future, so I’m pinning this so I don’t forget how to do this when needed! Hahaha well I’m glad it helped! Great info Erin! I’ve been using no follow for a year now and it hasn’t been a problem with brands. All of a sudden I’m being offered opportunities but with a do follow request. Really? I’ve said no every time. Yeah, I would too. That’s so silly. Why would you specifically risk endangering your own site for someone else? this post is so helpful! This is the first I’ve heard of “no follow” links, and I didn’t know they had to be present in sponsored posts. Thanks for sharing your wisdom! Pragati // Simple Medicine recently posted…Do I Need to Eat More Protein? Great info Erin. I honestly had no idea how to do a no follow link before, which is probably very bad. Well at least you do now! I paid more note to dofollow versus nofollow in the recent months. Gotta have that one down to get the proper juice from Google. Anytime! Hope it was helpful! Well then you are off the hook lady. Keep writing your awesome posts! Thank you so much for this post! I had no clue what no follow links were before this, but you have made it super clear! Thanks! Anytime Juliet! Thanks for reading and let me know if I can help you out with anything else! YES, this makes sense. I am going to change all of my product posts right now! Glad you found it helpful Emily! One question, I’m assuming you don’t have to do this for ads placed on your site, is that correct? To my knowledge you don’t and the ad codes that I get from networks don’t have a nofollow attribute in them so I don’t think so! Wow! This is great advice! I always wondered what “no follow” in a link meant. Thanks a ton! When I checked my site for errors, I had several no follow attributes that were creating errors (Squarespace) This is how I found your blog post, which has been super helpful. I am wondering how to take the no follow off? I will check in with Squarespace on that. Will pin this very helpful article! Are you able to look the the html view of your text? You should be able to take it out that way but I’m not super familiar w square space. Have mercy! I am so grateful for you! I tried FOR-EV-ER to get this to work using other tutorials. I am so glad I remembered you’d written this! It took ONE HOT MINUTE to get it done! thank you thank you thank you! YES. So glad I was able to help!! Wow you made this so easy to understand!